After months of anticipation, actors Deepika Padukone and Ranveer Singh tied the knot at Lake Como, Italy on November 14-15, in one of the most monumental celebrity weddings of 2018. For the twin weddings — a Konkani ceremony on Wednesday, followed by a Sindhi one on Thursday — the bride wore two gorgeous Sabyasachi looks with distinct style sensibilities. For the first ceremony at the picturesque Villa del Balbianello, Deepika wore a gorgeous red, rust and gold saree, while opting for a red lehenga at the Sindhi wedding ceremony. Deepika’s red bridal lehenga by fashion designer Sabyasachi Mukherjee was as breathtaking as expected and lived up to all the hype. Hand-embroidered with golden tilla, it featured innovative details — a Sanskrit blessing written in Devnagri on the dupatta’s border — and was paired with multiple statement jewellery pieces. Deepika’s overall bridal look was simply stunning and will soon be the stuff of bride-to-be inspiration. But did you know it bears a striking resemblance to actor Anushka Sharma’s bridal lehenga? For her wedding to cricketer Virat Kohli on December 11, 2017, Anushka chose a pink lehenga with floral embroidery and crystal and pearl appliques designed by Sabyasachi. Anushka’s lehenga became the symbol of fairy-tale celebrity weddings, and continues to inspire brides to this day. 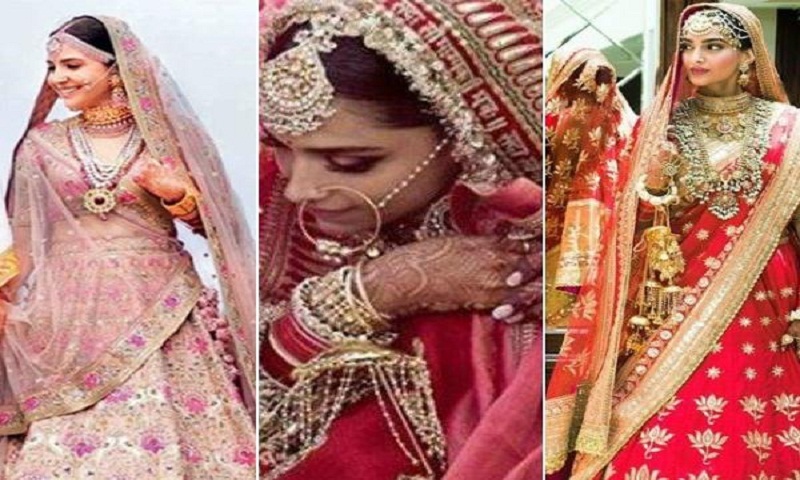 There is some obvious resemblance between Deepika Padukone and Anushka Sharma’s wedding looks — and their Sabyasachi lehengas aren’t the only similarity between the two. Apart from the hue difference, both celebrity looks are from day wedding ceremonies in Italy, and they’re both paired with traditional bridal jewellery from the Sabyasachi Heritage Jewelry collection. Deepika’s ethereal red gharara hand-embroidered with golden tilla details is in keeping with the traditional Sindhi bride. However, the innovative details on her chowki design aari-taari dupatta — it featured a heavy border with the age-old saying ‘Sada Saubhagyavati Bhava’ written in Devnagri, arguably the most special part of her wedding look — give a fresh, sentimental touch to Deepika’s bridal look. On the other hand, for her wedding in Florence, Anushka wore a blush pink lehenga, one of the most-often-referenced wedding lehengas ever. Keeping in mind the setting, Sabyasachi chose a pastel hue in place of a traditional red one for the day ceremony. Anushka’s voluminous A-line lehenga was covered in beautiful Renaissance embroidery in vintage English colours and embellished with silver-gold metal thread, pearls and beads. On his official Instagram account, the designer wrote that it took 67 karigars, 32 days to hand-embroider the lehenga in silk floss, which bore motifs of exotic birds and butterflies. The inclusion of multiple statement pieces in her wedding jewellery — a maang tikka, chandbali earrings, a bridal chuda, a nath (nose ring) and beautiful golden kalire designed by jewellery designer Rahul Luthra worn with a gaggle of bangles and rings — added drama and visual interest to Deepika’s bridal look. Anushka completed her bridal look with a mathapatti, layered necklaces and jhumkas in jadau — from Sabyasachi Heritage Jewelry collection — that was handcrafted with syndicate uncut diamonds, pale pink spinel and baroque Japanese cultured pearls, reports Hindustan Times.